Payment Methods in my Google Adsense dashboard. First, I went to the Payment Settings on the Google Adsense dashboard and clicked on Manage Payment Methods. Next, I clicked on Add Payment Method and selected Add new wire transfer details. I then filled-up the form with my personal and bank details. You should ask for your bank's official name and SWIFT code. I left the Intermediary bank and FCC fields blank. 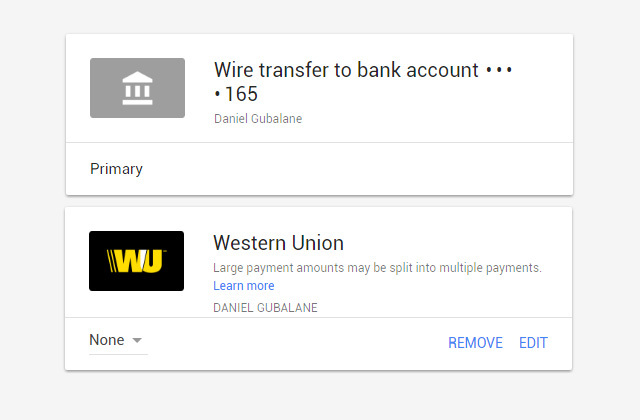 Lastly, click Save and you should now have Wire transfer to bank account... as a payment method. Make sure that this is set to Primary and you're good to go. After I received the Payment In Progress notification for that month, it took three days before the money was reflected in my bank account. When I was still using Western Union as my Adsense mode of payment, I was able to somehow control the exchange rate. I can check if it's high or low and choose to withdraw my payout the next day hoping that the exchange rate goes up. Nevertheless, direct bank transfer is more convenient and I feel more secure since there were reports of Adsense earnings being stolen in Western Union. How about you, are you going to switch to Wire Transfer as your Google Adsense mode of payment?